Now, social media is part of everyday business. It’s a time-consuming animal that takes some getting used to, and there is a certain finesse that has to go into it. Nevertheless, it’s unavoidable if you want to succeed in business today. Well, a recent study found that there is a misalignment between what marketers post on social media and what consumers want to see. By understanding where the misalignment is, you can plan out a social media calendar that gives you the greatest return on investment. 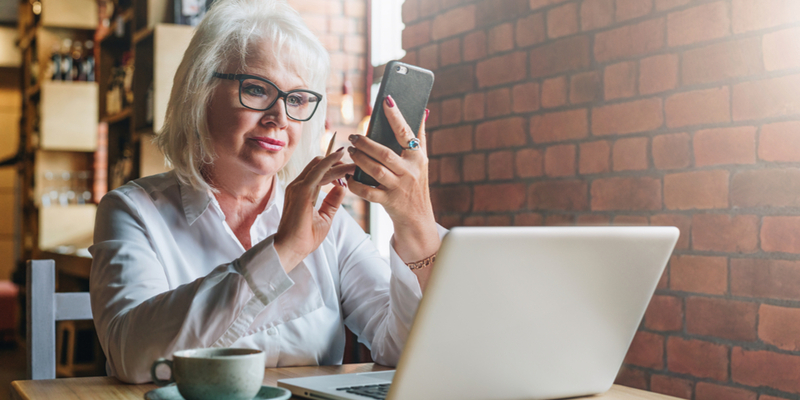 According to a study by Sprout, which surveyed more than 2,000 social media marketers and roughly 1,250 online consumers, marketers are not providing enough of what their customers want on social media. 1) Discounts & Promotions – 72% of consumers want discounts and promotions on social media, but only 18% of marketers are providing them. This one is understandable because it’s not really cost effective for marketers to run these types of promotions all the time. Plus, this kind of post can provide some good conversions, but it’s not what builds loyalty to a brand. 2) New Products & Services – Believe it or not, the next type of post consumers want is information about new products and services. This came in at 60%, but less than half (46%) of marketers are posting it. It’s important to point out that consumers actually want this kind of information. Too often, as marketers, we tend to do less of these posts because we don’t want to be too “salesy.” And while the idea behind that is valid, don’t forget that people actually want to know about what you can offer them. Products and services are there for a reason—to help people. Never forget that! Don’t make this your most popular kind of post, but do include them on a regular basis. 3) Posts That Teach Something – This one shows some alignment because 59% of consumers want to be taught on social media and 61% of marketers are posting this type of content. Providing useful information like this is the most common type of post that marketers are using, and it’s one of the key aspects of social media. 4) Posts That Entertain – This one is pretty close as well, with 56% in the consumer category and 47% in the marketer category, but it still shows room for improvement. People use social media because it is fun. They wouldn’t if it weren’t, right? So entertain them! Make their experience fun for them. Even businesses that offer products and services that aren’t really considered fun have opportunities to give their audience an entertaining experience. You just need to get creative. 5) Posts That Inspire – Here’s another alignment: 49% of consumers want inspiring posts, and 53% of marketers are providing them. People love to be inspired, and it’s one of the best ways to engage your audience. When people are inspired, they feel good, they want to share that feeling, and they feel good about your company for helping them feel that way. Posts that are partnerships with influencers – Only 12% of consumers want these types of posts, and 16% of marketers are posting them. Posts that showcase a company’s employees – Only 13% of consumers want these posts, but 24% of marketers are posting them. Posts that showcase a company’s personality – Only 23% of consumers want these posts, while 44% of marketers are posting them. Another misalignment has to do with posts that tell a story. 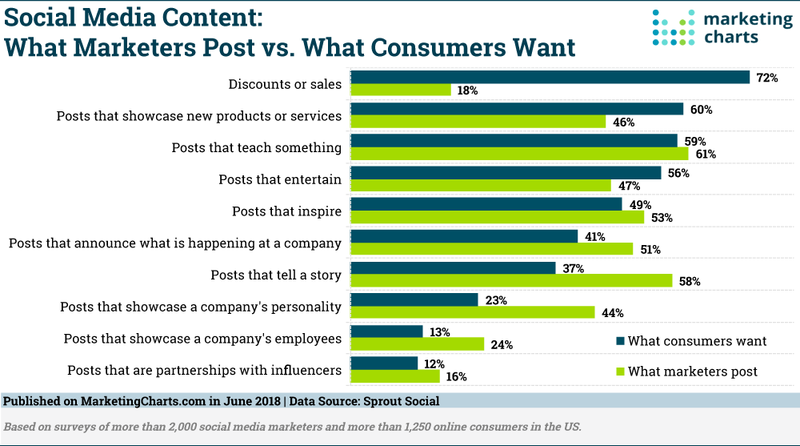 Marketers love these posts (it’s the second most-posted content after posts that teach something), but only 37% of consumers want them. Marketers are probably offering this type of content in an effort to get their audience to engage, but it seems they should be striving to do that through entertaining, inspiring, and teaching content instead. Why Does the Social Media Posting Discrepancy Exist? This discrepancy is a result of the marketer talking about what they want to talk about instead of what their customer wants. A lot of companies struggle with this because it’s not often evident what the consumer wants without digging for the answers. It is essential that you understand your customer, not just your product or service. If you don’t, you’re just spinning your wheels because you aren’t speaking to their hearts. When you don’t give them what they want, they will simply ignore you. After all, there are plenty of other posts to capture their attention. Think of social media in terms of designing content for your audience. It should be tailored to what they are hungry for. The posts that work are the ones that hit the mark by giving them what they are looking for in their life or work at the right time. Viral Solutions does this by teaching on social media and making sure we sprinkle in entertaining/inspiring posts and posts about our services. But before we can do all of that effectively, we have to understand our audience. That’s why we conduct research, hang out where they are hanging out, and get involved in the conversations they are having. We also help our clients do that as well. 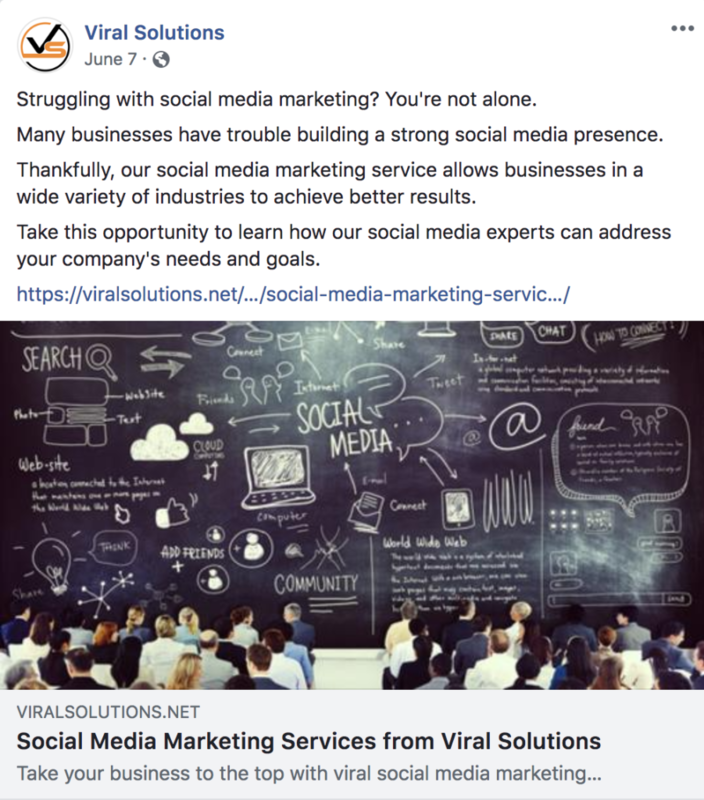 One of the goals at Viral Solutions is to ensure that our clients’ entire marketing strategy (including social media marketing) is based on the needs and desires of their market. The other essential aspect of social media is engagement. Without it, what do you really have? If your audience isn’t engaging with your social media content, you won’t accomplish much and your ROI will suffer. Your content needs to resonate with your audience in a way that makes them want to do something with it. That includes clicking on a link, liking it, sharing it, or commenting on it. People share content that inspires and entertains them. Do you know what they care about? Do you know what makes them laugh? By providing engaging content that impacts their heart and their funny bone, a business can increase the likelihood of their followers sharing that content and new potential followers seeing it. 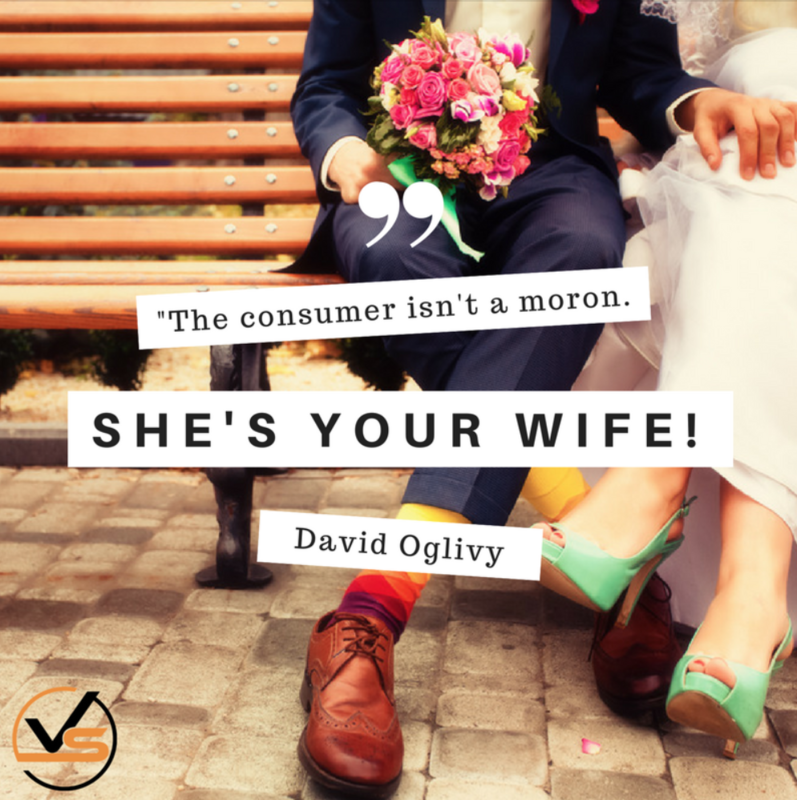 At Viral Solutions, we keep an ear and an eye out on social media so that we always know what our audience wants to learn about, what hits their hearts, and what they find funny. We take polls and we watch what they are doing on social media, and then we plan our social media content accordingly. The Sprout survey also showed that people want visual content, with 58% of the consumers surveyed preferring visual-first content, which can include graphics, images, and videos. In the video category, produced videos that are edited, beautiful, and promote a clear message are preferred. They watch videos to laugh, feel inspired, and see a good story. They want shorter videos (1-2 minutes) that provide value (not just an advertisement), and they want to know what they are going to watch before they watch it so clear captions and descriptions are important. By staying on top of the latest findings in social media posting, you can make sure that the time and money you put into your social media efforts are worth it. Don’t post just to post. Always have a pulse on what your audience is looking for and give it to them at the right time. That’s the formula for high social media ROI.